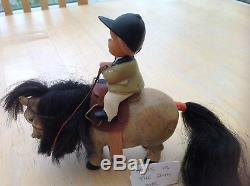 You are viewing what I believe to be a vintage 1960's Plastech model of a Thelwell pony. I have 2 of these available. 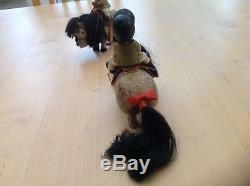 Both are in the same overall condition although No 2 has lost the bow on tail. They have both discoloured with age. The manes and tails are still thick. The elastic on both although they still have a little stretch are no longer tight. 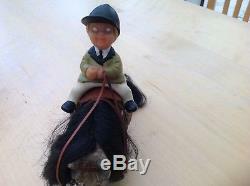 Saddle stirrups and bridle are all complete. Cash on collection is welcome. 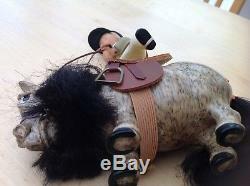 The final image is of the pony that remains. I can take more pictures if requested. 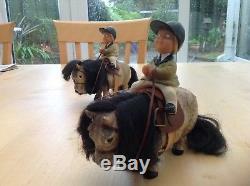 The item "Vintage 1960s Plastech Thelwell Pony Model Horse with Rider + Tack RARE" is in sale since Saturday, September 22, 2018. 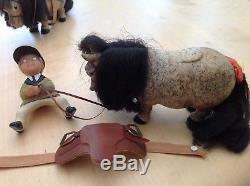 This item is in the category "Collectables\Animal Collectables\Farm & Countryside Animals\Horses". 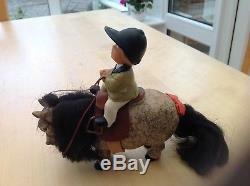 The seller is "bhanson650" and is located in Clevedon. This item can be shipped to United Kingdom, Antigua and barbuda, Austria, Belgium, Bulgaria, Croatia, Cyprus, Czech republic, Denmark, Estonia, Finland, France, Germany, Greece, Hungary, Ireland, Italy, Latvia, Lithuania, Luxembourg, Malta, Netherlands, Poland, Portugal, Romania, Slovakia, Slovenia, Spain, Sweden, Australia, United States, Canada, Brazil, Japan, New Zealand, China, Israel, Hong Kong, Norway, Indonesia, Malaysia, Mexico, Singapore, South Korea, Switzerland, Taiwan, Thailand, Bangladesh, Belize, Bermuda, Bolivia, Barbados, Brunei darussalam, Cayman islands, Dominica, Ecuador, Egypt, Guernsey, Gibraltar, Guadeloupe, Grenada, French guiana, Iceland, Jersey, Jordan, Cambodia, Saint kitts and nevis, Saint lucia, Liechtenstein, Sri lanka, Macao, Monaco, Maldives, Montserrat, Martinique, Nicaragua, Oman, Pakistan, Paraguay, Reunion, Turks and caicos islands, Aruba, Chile.